Home Media / Advertising Pakistani Brands Have Caught the Egg Fever! Pakistani Brands Have Caught the Egg Fever! The photo of the egg that became an Instagram record breaker for the highest number of likes has now reached new heights of popularity. It has now become the object of focus and is being used by many brands in their advertisement campaigns. The picture of this egg has been making headlines this month after it got posted on an Instagram account ‘world_record_egg’. Amazingly, it became the most liked picture on Instagram, surpassing the previous record by Kylie Jenner. Touching new heights of popularity, the egg has now become part of advertisements by many leading brands. The record-breaking has also resulted in a series of memes and trending social media posts. From automobiles and food to cosmetics and detergent brands, it can be seen everywhere and we just can’t simply get over this world famous egg! Have an Egg-xtraordinary shopping experience- only at Dolmen Mall! 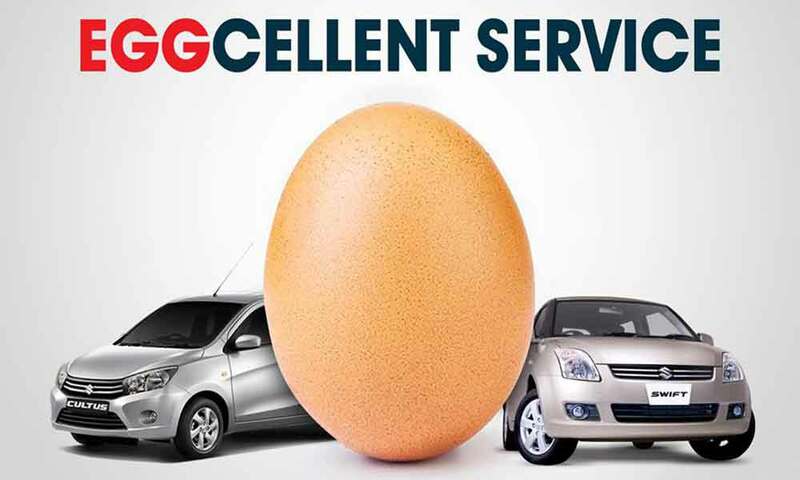 Suzuki, a leading automobile company, will be offering ‘Eggcellent’ Service from now on! You might wonder what an egg has to do with detergent? Surf Excel came up with this creative idea to use this egg in their recent advertisement and it fits ‘eggceptionally’ well! Peak Freans Sooper also availed the opportunity to bring innovation to their ‘egg and milk’ tagline! It’s just everywhere, one way or another! Doing wonders around the internet, an egg can do wonders for your beautiful hair as well! Some ‘Eggceptional’ Recipe Mixes by Mehran! Del Frio also revealed its #1 ingredient in the delicious cookies. Guess what it is? And the record-breaking egg just got fried in Mezan! Moos ‘n’ Clucks used it in their own way! The record-breaking egg is making chickens proud! Not only in Pakistan, but many international brands have also used this egg in their ads! Previous articlePTA to Block Unregistered Mobile Phones After 25th January 2019!